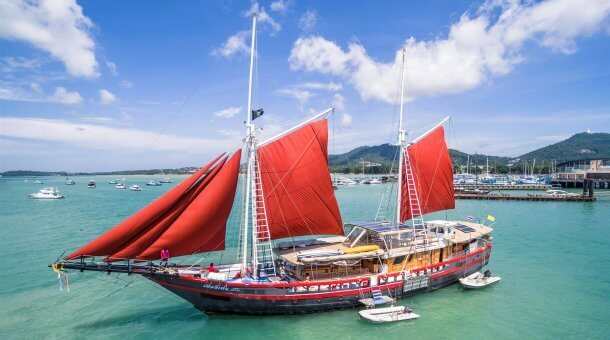 Bavaria is a brand new liveaboard launched in late 2015, based in Khao Lak and offering a mixed schedule of 3 or 6 night trips in Thailand and 6 night trips in Myanmar. The boat was designed by her German owner who has many years of experience here in Thailand. Bavaria is 28 meters long and can take up to 24 guests with a mix of cabin types to suit different budgets. There's plenty of relaxation space with outdoor shaded areas, an indoor saloon and a large sundeck. 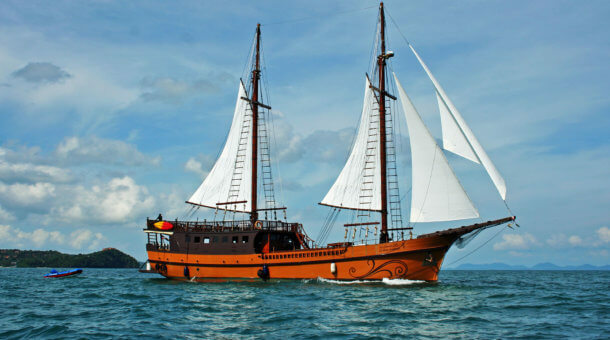 It's a quality mid price liveaboard designed by divers for divers. Bavaria has several cabin types – There are 2 Deluxe double bed cabins at the front of the main deck, plus 6 Comfort twin bunk cabins also on the main deck. On the lower deck are 2 Comfort double bed cabins. The 2 Standard twin cabins are on the upper deck. All cabins except Standard have private bathrooms with hot water, and are all cabins are air-conditioned. Bavaria takes a maximum of 24 customers, and will have at least 4 dive staff on board. The dive deck is very large, giving plenty of room for suiting up for your dives. An RIB (dinghy) helps with pick ups after the dives. Between dives, relax on the large sun deck on top of the boat – there is also a shaded area if you don’t want to get too tanned! There is free WiFi (when in range of Thai mobile phone signals). The indoor salon, also aircon, is equipped with TV, DVD and stereo. There’s also a large seating area outside the saloon on the main deck where meals are served. There are power points in all cabins and the salon for charging batteries. Food will be Thai (naturally) with some Western dishes, all served buffet style. Rental equipment is provided by the Bavaria liveaboard. Rental price is 600 Baht per day for a set (BCD/regulator/fins/mask/wetsuit) and 250 Baht per day for a dive computer. 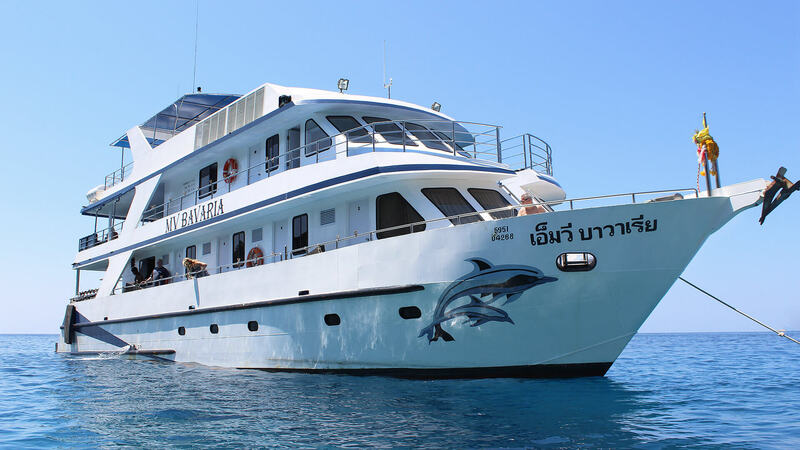 After pick up from your accommodation in Khao Lak you will go to the liveaboard office in Khao Lak to try gear before departure, or for trips departing in the morning you may need to check in and try gear the day before. Torches 200 Baht per day and 15 liter tank available 250 Baht per day. Nitrox is available on board @ 200 Baht per 12 liter fill, 1,600 Baht for 10 tanks, 2,300 Baht for 15 tanks. PADI Advanced Open Water course is 8,900 Baht. PADI Enriched Air (Nitrox) course is 4,900 Baht. Drinking water, coffee, tea are included. Sodas are 30 Baht. Beers 70 Baht. Wine 120 Baht per glass. Bavaria runs trips for 3 or 6 nights to the Similan Islands, Koh Bon, Koh Tachai and Richelieu Rock plus 6 night trips to the Mergui Archipelago in Myanmar. Note : This is an approximate itinerary. 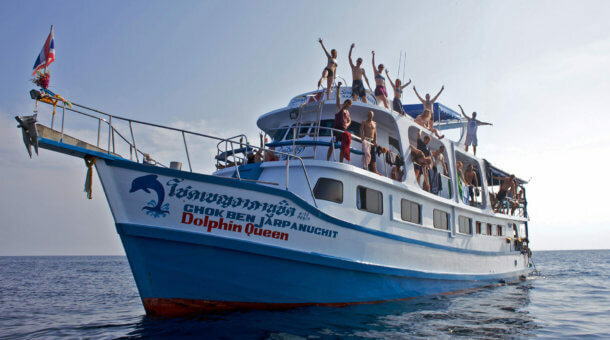 The 6 night trips include 22 dives at the Similan Islands, Koh Bon, Koh Tachai, Surin Islands and Richelieu Rock. Exact dive times will vary from day to day. There will be time for a couple of beach visits during the trip. Maybe a visit to the sea gypsy village on the Surin Islands. For the 3 day, 10 dive tours, you start the same time as the 6 day trip above. Then diving 2 full days, 4 dives per day, and 2 dives on the 3rd diving day, after which transfer is back to Thap Lamu by transfer boat, arriving back to land by 6pm. All dives are in the main Similan Islands chain of islands. For the 4 day trip you start with hotel pick up about 07:30 in Khao Lak and transfer from Thap Lamu port to meet the Bavaria late morning of the 3rd diving day during the 6 day trip (see itinerary above). First day will have 1 dive in the Similan islands then 2 more at Koh Bon, followed by 2 full days diving and the final day you have 2 dives, total 13 dives. Any questions about these itineraries, please do ask us! Note : This is an approximate itinerary. The 6 night Myanmar trips include about 23 dives in the Mergui Archipelago. Exact dive times will vary day to day. There will be time for some beach visits in Myanmar. NOTE : Divers need to check in 1 day before departure at the Bavaria office in Khao Lak to prepare equipment and check all necessary paperwork for entry into Myanmar. Bavaria will pick up guests in Khao Lak. Transfers from Phuket are not included. 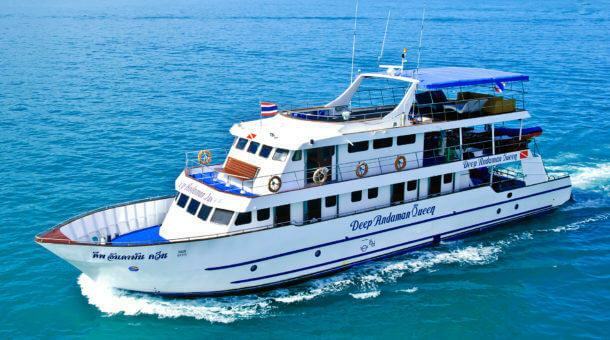 We recommend staying in Khao Lak if you take this boat.